Ask someone ten years ago what a Personal Video Recorder was, and they'd say "VHS". Today, a PVR is a standalone or PC-based digital video recorder, with Tivos and their clones for the masses, Linux boxes with six tuner cards for the geeks, and umpteen Windows Media Center systems for the rest of the world. What most of these systems have in common is great big ugly files full of stuff you don't want. For stuff you only intend to watch once, this doesn't matter; there's also no easy way to get video files out of low-end PVRs. But if you can get at the files, and want to make them pretty - which probably just means trimming crud off the beginning and end and removing advertisements - then you need a program like AVS Video ReMaker. Well, you do according to AVS, anyway. 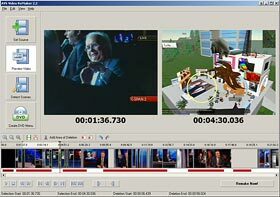 The purpose of Video ReMaker is to make it easier to chop up video files - in various popular MPEG-4-derived formats, not just MPEG-2. You can remove advertisements from PVR-ed television shows, or cut up other shows or movies into scenes. Then, Video ReMaker makes it easy for you to select the scenes you want and the scenes you don't, and write the edited file out in the same format as the original. 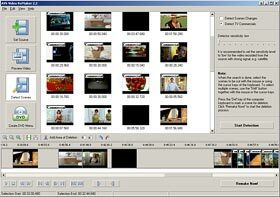 You can even join files of the (exact) same format together, and make DVD menus. Video ReMaker doesn't recompress video, or change its format, and it doesn't even let you shuffle scenes around. All it does, in essence, is remove parts from a video file and then output it again in its original format. That's all people want to do a lot of the time, though, and it has the large advantage that it's far faster than changing the video format, with no quality loss. 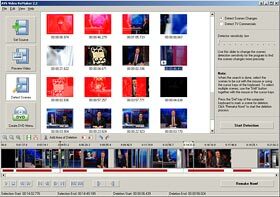 The evaluation version of Video ReMaker is a free download, but it's crippled; it can only output a maximum of five minutes of video. If you want the whole thing, it's currently $US59 for a lifetime license or $US29 for one year (both of those prices are, as I write this, $US10 cheaper than usual). When you register one AVS program you register all of them, and there's a long list. Each of them, in essence, does the job of one feature of one of the better-known audio-video packages, so you can mix and match AVS programs to get just the stuff you actually need. And there's nothing wrong with that. If all you need to do is a single task, then a single-purpose tool that Just Works is a much better solution than some Photoshop-esque teetering mound of features, and the AVS programs look like bargains if you've got a use for a few of them. Assuming, of course, that the AVS programs actually work. So on with the test of Video ReMaker. I'm happy to say that Video ReMaker is not obviously worthless. You might think there wouldn't be many commercial programs out there that were, but you'd be surprised. There's still tons of cack-handed old multimedia software floating around, often in branded bundles sold with DVD-RW drives and such, which is far outperformed by free alternatives. The way to do this sort of job on the cheap - as in, completely free - is with a program like VirtualDub or its mutated offspring VirtualDubMod. With enough effort, VDubMod can be made to comprehend all sorts of video and audio formats, and it too can easily output the original data without time-consuming recompression. VirtualDub isn't, however, very user-friendly even when it works fine with your files right off the bat. If you need to install obscure codecs and horse around to get the finished product to play smoothly and have audio lined up with the video, you may prefer to just leave the darn ads in the darn video (or cry havoc, violate some law, and download a copy that someone else has already pruned...). There are umpteen other such programs out there too, but the number with the same feature set as Video ReMaker - most importantly, compatibility with DivX and Xvid and so on as well as vanilla MPEG formats - is not large. Initial impressions of Video ReMaker are good. No crapware in the installation, no weird codec fiddling, no alarming Win3.1 installer window. And the program itself doesn't look like someone's weekend Visual Basic creation, either. There are a few oddities, but they're only small. The help files are a separate download, with little beyond a link to that download in the standard F1-key help window (and if you click that link, the download will be a child of the non-useful original help window, so if you close that window you'll close the download too...). And then you get the help for every piece of AVS software, all in the one file. But, heck, you buy 'em all at once too, so fair enough, I guess. Loading a file - or multiple files - and starting the "scene detection" procedure is very easy. What happens after that is less so. The red bits in the above picture are sections I've marked for deletion, via the time-honoured "click all over the place to make a colourful screenshot" technique. You get the idea. The more significant thing to look at in the picture is the number of scenes. The very large number of scenes. I fed Video ReMaker several test files, and even with its "Detector sensitivity" slider set to the minimum position, it invariably cheerfully sliced input video up into hundreds of tiny "scenes", many only a few seconds in length. 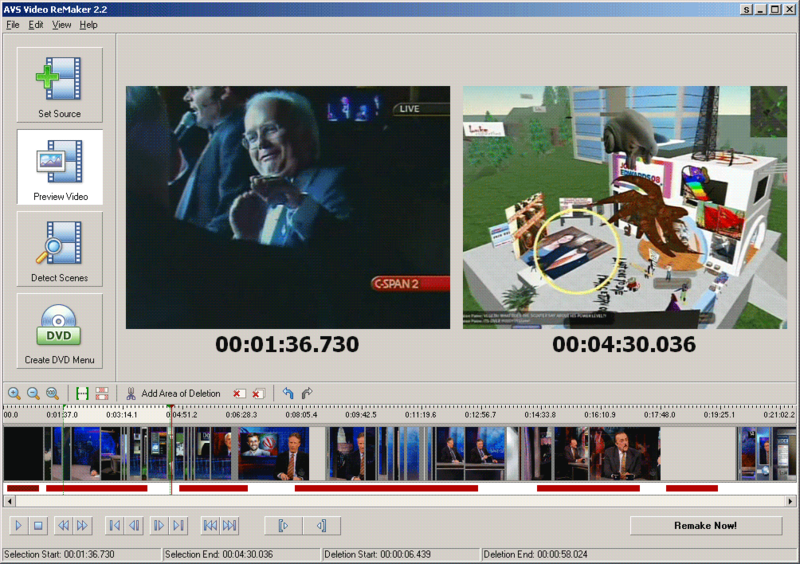 You can expect misbehaviour like that in fast-cut "Previously, on This Show" or opening credits sequences; there's no ISO Standard Scene that programmers can use to define which sudden cut with a colour change indicates the end of a scene and which is just someone looking out of a window. But that doesn't change the fact that Video ReMaker kept on going that way through whole episodes of Battlestar Galactica and Doctor Who, making "scenes" that were almost all under ten seconds in length, and quite often under one second. Then I tried it out on a Daily Show. It worked a little better then. Video ReMaker kept the intro animation as one scene, which was good, but that scene didn't end until more than a minute into the show - more than 30 seconds after the end of the intro. The actual segments of the show were, to be fair, chopped quite neatly on every major video transition. This, of course, still wasn't actually a proper scene-by-scene cut of the show, because each segment has many transitions in it. Pretty much every time the video switched from Jon to something else or back again, Video ReMaker inserted a "scene" break. Just cutting to different angles of the one interview was often, but not always, enough to set it off too. And this was minimum sensitivity. It found 57 "scenes" in one adless Daily Show, for an average of 22.5 seconds per scene. If, within the detected scenes, you could at least find cuts matching the beginning and end of every real scene, then I suppose the scene detection might still have some value. But on not one of the files I tested was this actually the case. Too many actual scene beginnings and ends were missed. You can, fortunately, ignore the detected scenes - or not even bother doing the detection at all - and hand-mark the segments you want to discard, using a conventional begin-selection, end-selection mouse-based interface with an optional pop-up number box for when you need fine precision. This works pretty well, but it's no real improvement over VirtualDub and its siblings. OK, so much for scene detection. Not utterly useless, but pretty close to it. What about the main attraction - automatic ad detection? I duly procured one nice clean standard-definition 400Mb DivX 6.5.1 copy of a TV show, which was bloated out to 65 minutes by vast and magnificent quantities of (Australian) ads. In commercial detection mode, Video ReMaker labels those detected scenes that look commercial-y to it, and some of them are right on the money. 15.0 and 30.0 second blocks of 100% pure ad. Even though it was only told to look for ads, though, and was again searching at minimum sensitivity, Video ReMaker split up this 65-minute file into 45 scenes, many of which were of no, or less than no, use. Ad-packed files like this one are exactly the kind of thing that you get out of a PVR when you make darn sure it records the show you want by putting a large buffer at either end. This particular file was topped with a news bulletin and a huge block of advertisements, and tailed by more news. Video ReMaker didn't correctly label all of the early ads - and fair enough, since you don't necessarily expect there to be twenty-three minutes of crap before the show comes along - but it perfectly spotted the actual start of the show when it finally arrived. It also perfectly spotted the end of the starting segment of the show, titles and all, and then correctly labelled the ads that followed. There were four generous minutes of those, all but the last 44 seconds of which Video ReMaker correctly identified as ads. The last unlabelled ad scene cut off exactly at the start of the show again, though, so the mislabelling was again no big deal. Now there were several minutes of actual TV show, which Video ReMaker cut into two scenes. But it failed to pick the start of the next ad break, leaving 45 seconds of ads on the end of the last "show" scene. It carved up the following ads into scenes pretty well, but didn't label them as ads, presumably on account of having failed to notice the start of the break. The next scene-break was, however, bang on at the resumption of the show again, so that was OK. ReMaker put the next whole block of show in one scene, which was nice, but it failed to pick the end again, accidentally including a 15-second ad for the TV station's news. ReMaker correctly scene-ified all of the following ads - and correctly labelled all but the first - and once again picked the resumption of the show perfectly. Then it dropped the ball slightly by deciding that the last 20 seconds of the show before the next commercial break was an ad. Another block of mostly-labelled ads, another perfectly picked show resumption, and the whole last four minute block of the show, with credits, was picked correctly. On balance, the commercial detection does help a bit, but it still seems too unreliable to really be worth much. You're still going to end up scrubbing around on the timeline to find the real parts you want, and Video ReMaker doesn't make that especially easy. Actually, its timeline zoom tool went mildly nuts while I was doing the ad-spotting analysis, and decided that every time I clicked the zoom-in button or pressed + on the keyboard I wanted maximum zoom, rather than just one level more than what I had at the moment. Stuff like that can really slow you down. On the plus side, the ad-detection process for the 65-minute file, on my currently-2GHz Athlon 64 X2 PC, took less than two minutes. That was only using one of the two cores; Video ReMaker is a single-threaded application. It is, however, possible to run multiple instances of Video ReMaker and either set the affinity of each manually to each of your cores, or trust in Windows to get it right by itself. This could be a significant time saver for people who have to plough through a lot of video. To try to trip up Video ReMaker's output formatting, I next tried feeding it a PAL SVCD MPEG-2 file. SVCD video has a DVD-standard 4:3 aspect ratio, giving 768 by 576 pixels - but each 768-by-576-pixel frame contains only 480 by 576 pixels of video data. This is how the SVCD format manages to cram so much moderate-quality video onto a mere 700Mb CD. Video ReMaker did indeed get a bit confused by this. All of the preview thumbnails were 16:9 aspect ratio with squished video in the middle and black bars on the sides. Just to be extra mean, this file was an old episode of The Goodies (yeah, I know, as opposed to all of the new ones...) that'd been ripped from VHS and was thus very fuzzy, even by SVCD standards. This could have been part of the reason why Video ReMaker's scene detection did an absolutely miserable job, taking quite a while to plough through the mere 27-minute file, and carving it up into two hundred and forty-two scenes, average duration 6.7 seconds. OK, fair enough, I didn't really want to detect scenes in that clip anyway. I just wanted to see whether Video ReMaker would mangle it when tried to edit the video. It didn't. It had "SVCD PAL" right there in the output box, with the option to output as plain MPEG-2 (same bits, different header), and it's even got a checkbox on the output requester in case you want to burn the new compilation right away. 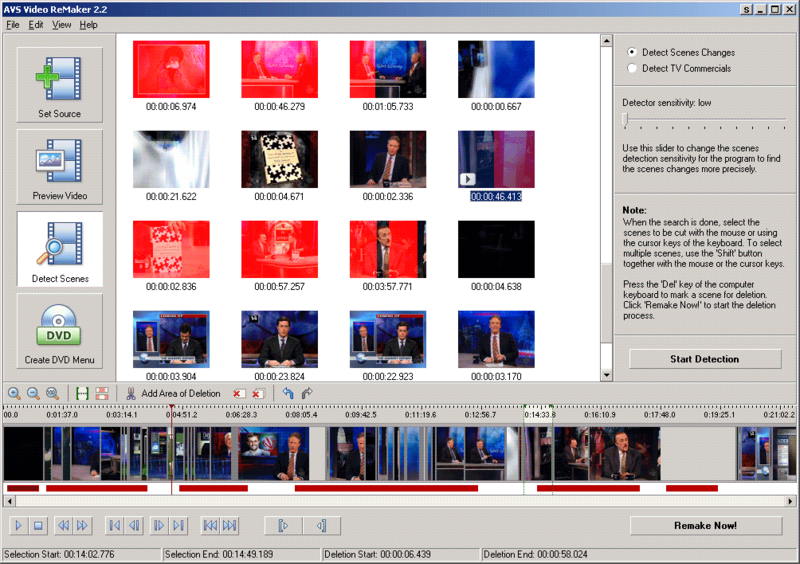 Video ReMaker has its own burning software, too. It doesn't just pop up your standard DVD writing software and leave you hanging. After this, I tried Video ReMaker out on the raw VIDEO_TS directory of a DVD rip, and it loaded the IFO file just fine, hooked up with the right VOBs, and displayed all of the scenes (chapters) into which the movie was naturally divided. I marked a bunch of scenes for deletion, I hit the ReMake button, and ReMaker happily output the edited video as a new VIDEO_TS directory with VOBs and IFOs and BUPs in it (with a parallel empty AUDIO_TS, of course), as per DVD normal. So if you want a quick and easy application for pruning scenes out of DVDs, Video ReMaker really does seem to do the job very well. And, again, it can burn the results to disc for you without needing another program. I'm not sure why most people would want such a thing, though. Perhaps for fast editing of home movies, or because you want your kids to see Easy Rider but want to make sure they never see the LSD scene. Or something. Sorry. I got nothin'. If you want a program that can do this, though, this program can, fast and simply. If you're encoding PAL or NTSC MPEG-2 files - in other words, either a ripped DVD/VCD/SVCD or something else that you've converted to that format elsewhere - you can even create a DVD menu to go with them. Though that isn't of course difficult to do with any number of other programs, once you've already got your separate files. I was alerted to the existence of Video ReMaker by ReviewMe, a site that lets people like AVS pay people like me to write reviews of their products. And yes, this is therefore a paid review. I'll be getting ninety-eight whole US dollars for it. Hence my suspicion. ReviewMe is not really a hive of scum and villainy - there's nothing wrong with a company paying for a good review of their product, as long as that's what they actually get. 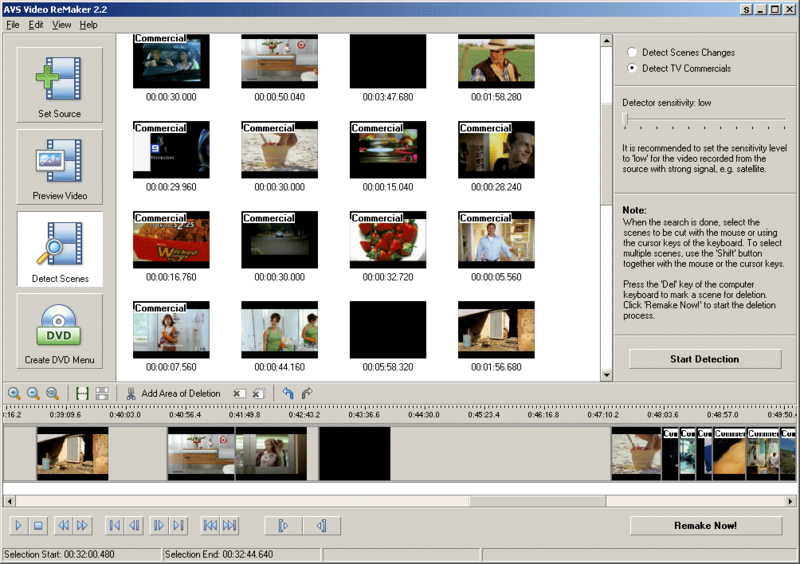 But Video ReMaker is nonetheless one of those pieces of software that nobody (until now) seems to have reviewed anywhere. That, in combination with even the faintest hint a desire to pay for a (presumably good...) review, is usually a very bad sign, as I have explained on previous occasions. That's not the case here, though. Even if Video ReMaker were complete garbage, which it isn't, most of the other packages in the AVS lineup would have to be rubbish as well to make the whole deal a bad one. But I'm still somewhat puzzled about why AVS wanted me to review Video ReMaker. Because, as mentioned above, it's just not that amazing. Video ReMaker doesn't have any show-stopping problems that I could find. No slipping audio sync, no glitches at the edit points, no incompatibility with formats it claims to support. I noticed no screw-ups with variable-bit-rate audio, either, which is well worth mentioning; VBR audio by definition does not "line up" with the video, which can create problems if you chop a chunk out of the file. And ReMaker's manual editing works well enough, too. But, y'know, manual editing has to work, because the automatic stuff doesn't. "Saving your time and effort it deletes the commercials", eh? No, not really. Video ReMaker might - might - save you a whole minute in the de-commercialising of a one-hour show, but I wouldn't bet on that. If you actually use the ad detection feature and then skip through the resultant "scenes" to try to find your edit points, it seems to me that you'll spend more time scanning backwards for the right cut points than if you'd just scanned through forwards in the first place, the old fashioned way. And VBR audio is not important for most of this sort of editing anyway, because PVR gear generally doesn't output files that have it. If Video ReMaker were an unusually slick editor for its one simple task then that'd still make it remarkable, but it isn't. It doesn't have particularly fast "scrub" speed (the speed with which the program presents you with a preview of the point in the timeline you just selected), for instance. Neither does almost anything else on the market, mind you - I think the only way to do fast scrubbing for a range of file formats is by eating a buttload of RAM with a big look-up file. If you only intend to work with MPEGs, though, you might like to check out the 30 day trial version of Womble MPEG Video Wizard, which apparently does have fast scrubbing. Go ahead and check out the evaluation version of Video ReMaker, and see if you think that it, plus any selection of the zillions of other "AVS4YOU" programs, is worth the all-in-one registration fee. I think it's a pretty good bet that you'll find a few pleasing programs in there. If you've already spent the time to learn to use something else that does the same stuff, then AVS probably won't be able to beat it. But their products seem solid enough, and are as easy to learn as anything else I've seen. I like the idea of breaking out featureful software into lots of single-purpose apps. But don't believe the hype. Video ReMaker has some nice features, but the big ticket stuff doesn't work as advertised. So it's really just a face in the crowd. Video ReMaker is an AVS product.